Carrot Kheer reminds me of our last year Onam celebrations. Its been almost an year and very soon the next Onam will be here. We had a payasam competition as part of our Onam celebrations and I prepared this colorful payasam. Though I didn't recieve any prize for the payasam but surely got lots of appreciation for an innovative colorful payasam. This is one of the easiest desserts to prepare after Vermicelli kheer /Semiya payasam. And the natural appetizing colour is so pleasing to the eyes. Believe me kids were mad after this payasam. I have made this 5-6 times after the first time. This payasam definitely tastes best when chilled but make sure to bring it to room temperature before serving else the ghee or clarifies butter is solidified. Frankly speaking the pics have not justified the recipe well. I feel should try and update the pics whenever I make next. The carrots cooked and pureed adds the natural colour to the payasam. The grated carrots adds a nice crunch in between along with the nuts and raisins. Do try this out and enjoy !! Wash and peel the carrots, keep aside. The two carrots listed as cubed should be diced small and add in a sauce pan or wok with 1/4 cup water. Boil till its cooked half way through (takes about 3-4 minutes). Drain the water and grind or add little water and grind to a smooth paste. Take the other two carrots listed and grate using a grater. Keep aside. In a heavy bottomed pan, add ghee. When it is hot, add the cashews and raisins. Fry till its golden brown. Drain and keep the fried cashews,raisins in a plate. In the remaining ghee, add the grated carrots and saute till the raw smell of carrots disappears. Add the milk and boil the mix. Add sugar and continue to boil for another 5-6 minutes till its slightly reduced. Add in the ground carrot paste and the condensed milk, stir well without any lumps. Simmer for another 5 minutes. Add the cardamom powder and the garnish items; cashews and raisins. Keep covered for 2 minutes if serving warm. It tastes delicious when cold more than the warm payasam. Enjoy !! * Each cup of milk is 250 ml and so use 4 cups. If using a 200ml = 1 cup ,then use 5 cups. * Add sugar as per sweet tooth. But try and use condensed milk as mentioned as the consistency really matters with the condensed milk. * As the payasam sits, it leaves out the natural color and tastes delicious. * You can add sago or tapioca pearls for a more appealing look and taste. For more payasam/ pradhaman recipes, check out here. Hope everyone is doing good. You all might be wondering about my absence as I try not to shut this space down unless am so tightly packed. Once I put my pen down or postpone to post recipes then it is like never to start again. Laziness crawls in and hibernation sets for ever. There are many reasons that I can jot you down in this small gap that made me stay away from my space. However, there is one genuine reason that I can quote and which surely was the beginning of this shut down. I had joined up for a course and literally was on the toes those days. Studies after a big gap was something like never thought before. Anyways, thanking God for his blessings and prayers from all well wishers which helped me complete the course successfully. All thanks to many of my fellow bloggers who did check back if all things were fine at my end. Thanks dear friends for all the love showered. I shall surely get back to peep in each of your spaces, learning and exploring new recipes, thoughts and tips as much as possible. Hopefully trying to be regular in posting recipes as well. 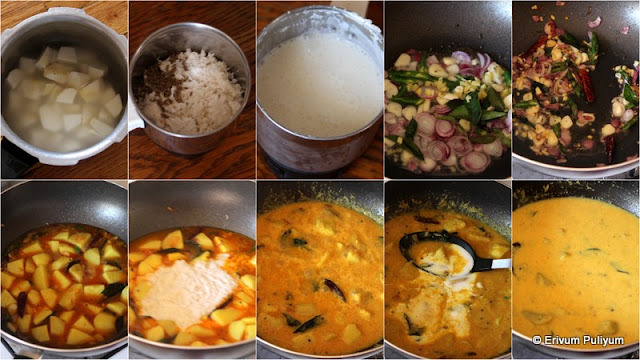 Coming back to today's recipe its a traditional Kerala curry. Chembu(taro root) is a rich source of dietary fiber and carbohydrates. They have many important vitamins and minerals in them. The stem and leaves are also edible of chembu (taro root). Chembu was not liked by my H and so invariably this was the last vegetable added in my pantry. But one day I made chembu astram and he was mad over the curry. From that day onwards he likes chembu in these few curries. This is a similar curry to astram and can be enjoyed with steamed rice. You can make this recipe with kannan chembu (small) or cheema chembu(big ones). We had this curry with cabbage thoran, velluthulli achar, fish fry and hot steamed rice. This curry is really delicious ,creamy with yogurt and ground yogurt. Enjoy your way with this yummy curry! Peel the chembu(taro root) and wash under running water.Cut in small cubes,add to a pressure cooker with enough water,turmeric powder and salt.Cook until the taro root(chembu) gets cooked(don't over cook) or tender. Heat oil in a mann chatti or clay pot or non stick pan and when the oil is hot,splutter mustard seeds. Add in the sliced shallots,chopped ginger,garlic and green chillies.Saute until shallots turns translucent.Add the turmeric powder and chilli powder.Add the cooked taro root(chembu) along with water.Mix well. In the mean time,grind the coconut with cumin seeds to a fine paste.Add this paste to the taro root mixture.Simmer for 2-3 minutes.Add in the beaten yogurt and simmer for one minute or wait till the bubbles appear at the sides.Switch off flame and serve warm. * Add beaten curd once the curry is thick enough and don't boil over once the curd is poured. * You can add the tempering at the end too, in that case add the ground paste to the cooked chembu(colocasia) and then finally add in yogurt. Switch off flame. In another pan,heat oil and splutter mustard seeds and all the other temperings. Saute well and pour over the curry.